There are two major types of fins on the market today; open heeled and close heeled. 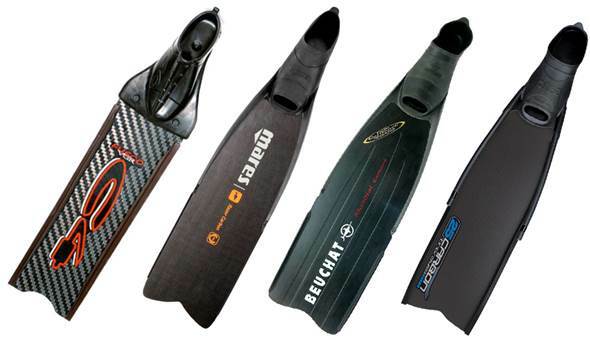 Open heeled are more common among SCUBA divers, but there are a few free diving specific versions of open heeled fins available on the market today. The advantages of open heeled would be the ease of donning and the ability to wear hard soled dive boots with them. This is useful when diving in an area where access to the sea is restricted by rocks and rough terrain as the boots will protect the diver’s feet and the fins can easily be donned at the water’s edge. 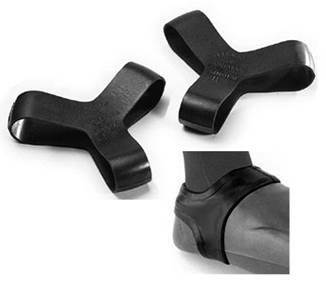 The disadvantages of open heeled fins would be the overall bulky design of a foot pocket and the loss of power common with the loose fit of these style fins. 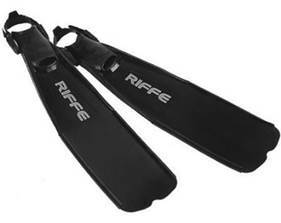 Close heeled fins are the preferred choice for free diving and there are many free dive specific versions on the market today. 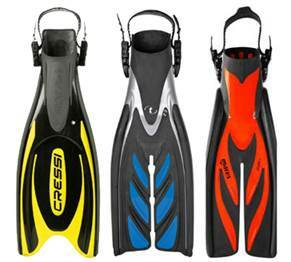 The top two advantages of the close heeled fins would be the streamlined design and secure fit. The secure fit translates into increased power and the streamlined design results in reduced drag. There are a lot of factors to review beyond the simple open heeled / close heeled design types. Blade length, stiffness, and material are the next important factors. Longer length blades are preferred overall and definitely for deeper diving as they will provide the much greater propulsion needed during ascent and ease the overall exertion during descent. Exerting less energy you waste less oxygen. Saving oxygen will improve your breathe hold. The three most common materials used in manufacturing blades are polymer (commonly referred to as plastic), fiberglass and carbon fiber. Carbon fiber provides the stiffest blade which results in the best propulsion with least efforts. They are also the lightest available. The disadvantages of carbon fiber blades would be the fact that they are much more delicate, and quite expensive. 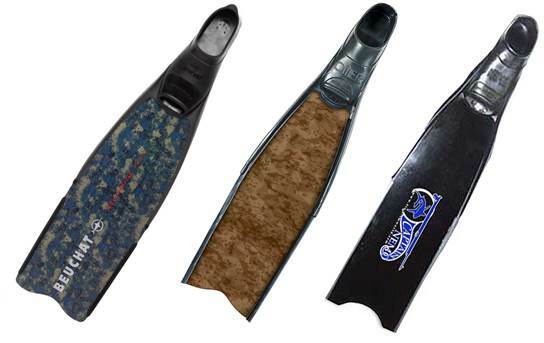 Fins with carbon blades range in price from $400 to $600 US dollars. Fiberglass blades provide nearly the same stiffness as the carbon blades, are more rugged, and can generally be purchased for about $100.00 less than carbon. Fiberglass blades provide a nice “lower cost” alternative to carbon blades. Both the carbon and fiber blades are commonly available in two to three stiffness, ranging from 1 to 4, the latter being the stiffest. Polymer blades are the most common blades on the market. They range in price from $50 - $269 US dollars. Of course polymer blades do not provide the stiffness of carbon fiber or fiberglass blade, but they are very rugged and the least expensive. The blades are commonly available in two stiffness. Most manufacturers differentiate this difference with the color of the blades. Gray being the softest, and black being the harder. The price to performance ratio of polymer fins makes them a great starting point. Many manufacturers are currently offering carbon and fiber blades separately from the shoe pockets. This allows the diver to choose from blades and shoe pockets manufacturers. When assembling fins from different blades and shoe pocket manufacturers, the attachment of both components has to be customized. Glue, instead of screws is recommended to attach the blades to the foot pockets. 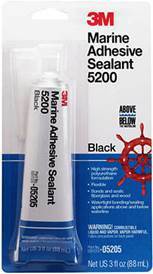 We recommend 3M 5200 marine adhesive. Make sure to follow the directions for use when using this glue, as the drying time is very important to the performance of the glue. As mentioned before the closed heel pocket is preferred among free divers because of its streamline design, but it is also susceptible to detachment from the foot during hard kicking or strong current. Thankfully there is an inexpensive device to prevent this; is called the “fin keeper”. Now, with the above information you are ready to move on to the next most important deciding factor when purchasing your fins… FIT. A proper fitting fin will result in more power, efficiency, and most importantly comfort. A poorly fitting fin can result in cramping, blistering, and power loss. The best way to decide on a fin is to try them on. Make sure to wear a pair of neoprene socks and try different sizes and different models. The ideal fin should fit slightly snug so that you do not have any slop, but should not fit too tight. A fin that fits too tight will only result in your feet cramping while you are diving. The silicon/rubber foot pockets of the fin will generally conform to your feet nicely, but make sure that the overall pocket design isn’t too narrow or too wide for your foot as the foot pocket will not change in shape with use.